Vastu is an ancient Vedic science of layout planning of buildings that has stood the test of times, influencing peace and prosperity of the inhabitants. Vastu science does not find its roots in astrology but is a science which deals with the management of cosmic energy in Building & Structures. It has strong scientific base & is not a myth. Vastu is an ancient Indian science of architecture and buildings which helps in making a congenial setting or a place to live and work in a most scientific way taking advantage of the benefits bestowed by nature, its elements and energy fields for enhanced wealth, health, prosperity and happiness. In modern times, the knowledge of house building technology has grown so vast, that it has been branched off into special fields such as architecture, engineering and Interior decoration. Architecture deals with the Internal comfort and external beauty, Civil engineering deals with the structural stability but Vastu provides with the knowledge to be adopted in building a house so as to make the native happy, healthy and prosperous. Vastu principles are applicable to individual residential houses , industry, educational institutions, commercial complexes , theaters, hospitals, churches, etc.. If colonies, villages and cities are planned on its principles, it is said that they will all be very prosperous. 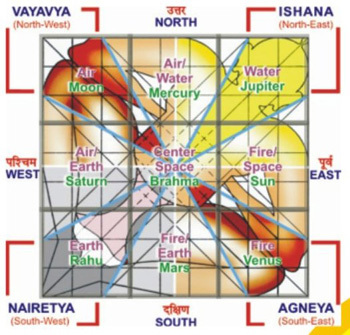 To understand Vastu all one needs is a little knowledge about Astronomy. We know that our earth, while moving around the sun, continues to spin on its own axis with a tilt of 23.5 degree. While spinning, the earth moves from West to East. You will observe that car is designed in such a way that its front part is kept lower than the rear part, to enable it to overcome the wind resistance when in speed. Similarly the nose part of the plane and rocket are kept tapering forward. 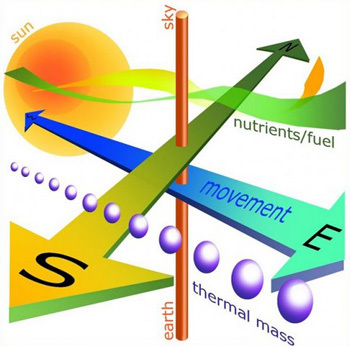 Since our earth is moving from West to East, if your building is lower on the East and higher on the West, only then it will be able to withstand the resistance of winds easily and get filled with positive energy from North- East, leading to peace and prosperity of the inmates. Thus a clear understanding of the principles of science can help you to delve into the true meaning of Vastu Shastra and reap its benefits. Rejecting Vastu science summarily may result in your being subjected to harmful effects unknowingly for the whole of your life. It is common sight to see one industry or business house flourishing while another similarly planned unit run into problems. When in trouble we find it easy to blame the luck but have we ever paused to ponder that it might be the structure and their placement in the factory that might be responsible for the troubles. Does it sound unbelievable? May be, but then it is a time tested fact that when industries are constructed observing the principles of Vastu, there is peace and prosperity, while those breaking these tenets find themselves forced into unwanted troubles and miseries.